We had a steady supply of pheasant over the last season, thanks to a beater/shooter friend down at our local pub. Two gay-braces we received were earmarked for a pheasant coq au vin. But I changed my mind. Cooking with beer is all the rage right now, so I shunned the grape. The question was: what beer? Everything in the “cellar” was either too bitter or were quite special “collection” beers. So I wandered up to Waitrose and pondered over the selection of bottled ales available. Our local Waitrose has a decent range of bottled British beer, however I’m not really familiar with this territory since I prefer my bitter in cask form. Unfortunately the bottled versions of good cask ales are rarely up to scratch. So I scanned the beer names and read some label blurbs… one ale seemed quite apt: Poacher’s Choice by Badger Brewery. I had never tried Poacher’s Choice before. Liquorish and damsons? Unusual, but – thought I – with a certain appeal in the context of a game stew. I took a punt on it and bought 6 bottles. What’s the beer like? As I suspected: a bit odd. Which is to say you may be a little surprised on the first sip of a pint of it down the pub – this is no bad thing! But I do suspect it’d strongly divide opinion. The Badger website describes this beer as “subtly fruity”, but compared to a similar strength/colour/hop-level beer I’d call it “boldly fruity”. The beer has a bubblegummy, plum-conserve character. 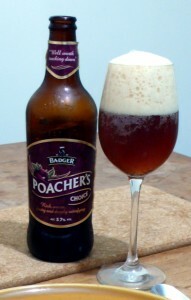 I rather enjoyed a glass of Poacher’s Choice: I wasn’t keen initially but it grew on me, and blossomed. I’d say you need to be in a fruity frame of mind to enjoy this beer. I wasn’t at all apprehensive about stewing with it, it seemed a most excellent candidate. So, a recipe was afoot – and like all good stews it is a simple one. Well, not so simple if you’re starting with pheasants still in all their feathery finery. You’ll be forgiven for picking them up oven ready, or even jointed. In fact this stew would work well with rabbit, probably pork, and definitely the coq you’d use in a coq au vin. This is just approximately what I put into my stew. As with any stew the ingredients are very flexible. If you don’t like mushrooms, leave them out! Or you could throw in some potato or parsnip. Get the idea? When it comes to stewing my weapon of choice is of the heavy enamelled-iron variety. The stew made with the ingredients above fills a 28cm Chasseur, which is about 6 litres. Fry the lardons in the stewpot until golden, then remove them to a bowl leaving the fat in the stewpot. Brown the pheasant pieces in batches, this is to ensure the meat isn’t crowded in the pan. After the first batch is browned add a tablespoon of oil to the stewpot between batches. For the amount of pheasant in this recipe I browned the meat in 4 batches. After each batch is browned remove the meat to the bowl with the lardons. Place the fine-diced onion into the stewpot and fry over lowish heat until it browns, begins to break down, then goes quite mushy. While the onion is frying use a wooden spoon or spatula to scrape the toasty goodness from the pheasant-browning off the bottom of the stewpot. Before the onion begins to stick pour in the beer, then add the meat, the chopped vegetables, bay leaves and juniper berries. 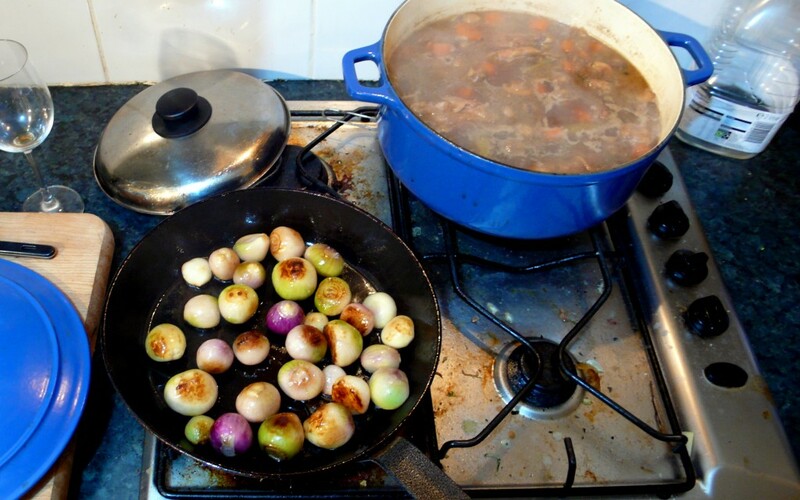 Ensure everything is tightly packed then top the stewpot up with the game stock until everything is covered. Gently simmer – there should be the barest movement visible and few, if any, bubbles – until “done” (i.e. the meat is tender, but not disintegrating!) My stew was simmering for about 3 hours, which is probably longer than necessary. About 30 minutes before you think the stew is ready brown the peeled shallots in a frypan with a tablespoon of oil and pop them into the stew. (If you put these in at the start they’ll simply turn to mush.) Pop the sliced garlic in now as well. Do you want to thicken the gravy? The onion will have lent it some body already, any further body will depend on your stock. I like a stew to have a fairly sticky gravy so I thickened this one up a little. To do this strain the stew through a large sieve or chinois, collecting the gravy in a bowl. Put the gravy back into the stewpot and bring it to simmering point. In small pan over low heat melt 25g of butter then stir in 25g of plain white flour. Stir with a small whisk to combine the flour and butter well – and, stirring all the time, gently cook for a minute. Now, a ladle at a time, whisk the gravy into this roux. Initially it’ll thicken drastically, but don’t worry it’ll thin out as you add gravy. To avoid lumps be careful to whisk in each ladle of stock thoroughly and evenly. Continue until your have about a pint or two of thickened gravy, or the consistency of double cream. Finally whisk the thickened gravy into the gravy remaining in the stewpot. (Pass the thickened gravy through a sieve if you think you might have ended up with lumps.) Simmer for 5 to 10 minutes, gently whisking all the while. When complete add the stewed meat and vegetables back into the thickened gravy. Of course: enjoy with a glass of Badger Ale’s Poacher’s Choice. The flavour of the beer came through distinctly in the stew. There were a few bottles of BrewDog 5AM Saint, which can make a rather good stew, but I’d like to get off the BrewDog theme for a bit. Hitchin, the town in which we live, lacks what I’d consider a decent independent bottle-shop. I’m tempted to try opening one myself, but the local market for craft beer is probably too small to run the sort of place I’d like to have. Plus, I haven’t a clue how to start such a venture! 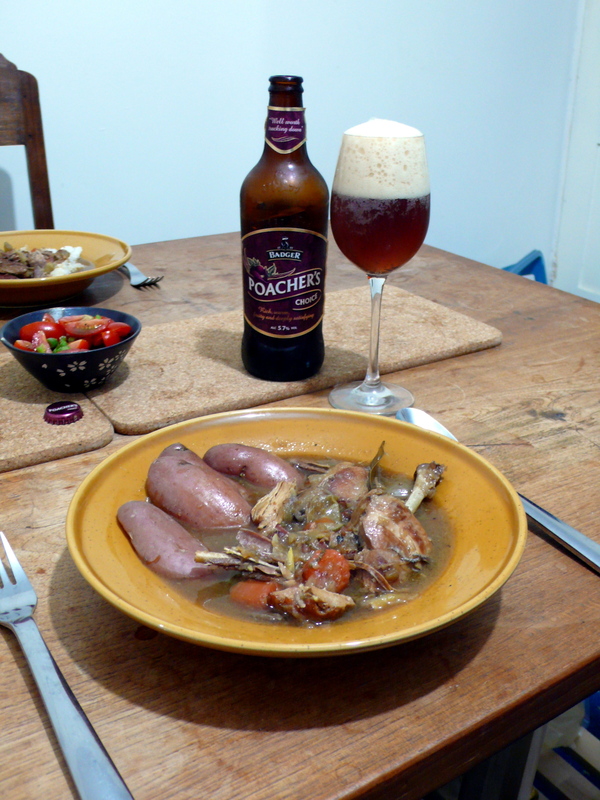 This entry was posted in Cooking, Recipe and tagged Badger Brewery, Pheasant, Poacher's Choice, Stew by Yvan Seth. Bookmark the permalink.